So, let me catch y'all up on some of the super-de-duper things that have been going on in my life. I have been given the opportunity to volunteer with my sorority a lot since I have moved to DC. Last week I was appointed by the National Council to serve as an Alumnae Officer, and I can't begin to tell you how excited I am to be a part of the Alumnae Projects Team. 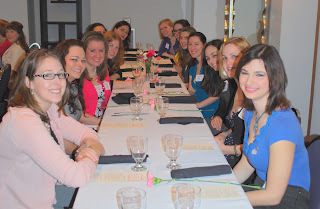 It seems like just yesterday that I was meeting some of my Alpha Nu (University of Florida) sisters for brunch at the Mayflower just shortly after I moved to DC. I was asked by one of my sisters who was currently the president of the DC Alumnae Chapter if I would be interested in joining, which I was, so I did. It was nice to have some events to go to throughout the year and meet sisters from other campuses around the country. I ran for secretary the following year, and was able to work with some awesome women and really develop a strong communication system that I'm really proud of. This year I'm serving at the VP of Programming and am so thrilled to be able to work with some truly fantastic women. Our first "official" event was this past weekend as we celebrated Phi Mu's Founder's Day with a fun brunch at the Carlyle Hotel in Dupont. Also being involved in the alumnae chapter gave me the opportunity to learn about other ways to volunteer with Phi Mu. One of those was by advising the local chapter at American University. I began as the Academic Excellence Adviser, then PR, and now my true love...Recruitment. I am seriously a dork over singing songs, conversation workshops and funny skits. The very best part of being an adviser to me is seeing the positive impact I have on these young women's lives. It's amazing to watch them work hard and accomplish their goals. Seriously to see that sparkle in their eyes-when a big announcement is made or how the hold their shoulders up a little higher after being elected as a leader by their peers. It's such a rewarding experience. I have also been rewarded by building friendships with the other advisers on the board. It's been so much fun to get to know these ladies, and I really feel like I have made great connections and life-long friends with these women. The other night we got together to prepare a sweet's table for the new member retreat that Claire hosted at her house-how cute is this? We then treated ourselves to a Mexican Fiesta at Guapos-so fun, and just as good if not better then one of those cupcakes. Congrats! That is a wonderful honor. 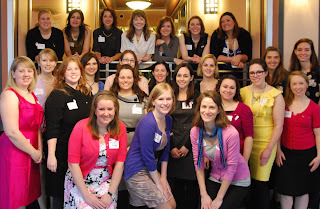 I have served as treasurer for my ZTA alum group for several years. 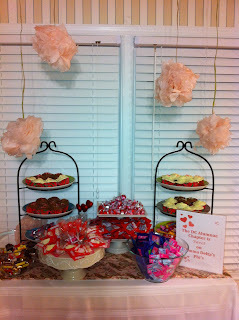 I heart the sweet treats. I'm glad the cupcakes are gone, though. WE need to have another guapo's night!